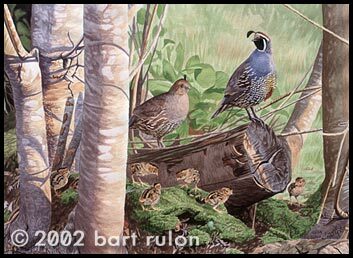 California quail are regulars at my bird feeder, which I can see from my studio window. When they come to the feeder I always stop to watch for a while. They are very cautious birds, especially when the little chicks are around. When a covey with chicks comes through, the male always keeps an eye on me from a lookout perch. Any quick movement can send them off to the bushes in a flash. The Sentinel is a tribute to the ever-watchful duty of an adult California quail.